There is a power struggle underway in the NASCAR garage. It’s a conflict as old as the hills, beginning when Glenn Dunaway won the first NASCAR-sanctioned race on June 19, 1949, only to have a post-race inspection reveal illegally modified springs beneath his winning car, handing the victory to Jim Roper. Since then, NASCAR’s post-race inspection process has evolved exponentially, from tape measures, plumb-bobs and eyeball assessment to lasers and computer-aided scanning devices. What hasn’t changed is the ongoing tug-of-war between the sanctioning body – pledged to uphold its rules to the expressed letter of the law—and the competitors, for whom the slightest advantage often means the difference between victory and defeat. In recent years, the clash between racer and sanctioning body has become more heated – or at least more visible – to the point where midweek penalty announcements from NASCAR’s North Carolina-based Research and Development Center often generate more headlines and water cooler talk than the competition on the race track. That has got to change, and that change requires nothing less than a fundamental change in the functional dynamics of the sport. Templates are a thing of the past. In short, NASCAR and its teams need to declare a ceasefire in their decades-long game of “us against them” in favor of actually working together – for the first time in history – to save the sport from itself. Fans say they are ready for that change. In previous seasons, a majority of NASCAR Nation sided with the teams when post-race penalties come into play, accusing the sanctioning body of being over-officious, nitpicky and far too interested in hogging the spotlight. Nobody buys a ticket to watch the umpire, after all, and there have been times when NASCAR has lost sight of that fact, in its zeal to police the sport, right down to the letter. In recent weeks, however, fans seem to have lost patience with the weekly slate of rubber-stamp violations, blaming teams for “pushing the envelope” too far in the same exact areas, over and over again. The teams have done little to combat that perception, often adding to their own credibility gap. In the opening eight weeks of the 2018 MENCS campaign, a handful of elite teams complained long and loud about the sport’s new spec air gun program, citing “inconsistencies” in performance, up to and including outright failures. Only after weeks of bashing the sanctioning body for an alleged lack of due diligence was it revealed that some teams had ignored manufacturer recommendations by utilizing helium gas instead of nitrogen, over-revving the units and compounding the likelihood of failure. “Pushing the envelope” seems lately to have morphed into a willful, weekly defiance of the rules, with teams manipulating their cars in ways that Glen Dunaway and Jim Roper could never have imagined. Flexible braces allow rear windows to deform at speed, channeling air to the rear spoiler in a way that adds downforce and improves performance. Illegal suspension tweaks allow rear ends to shift under load, creating on-track “yaw,” increasing side force and adding additional speed. Teams say they don’t intentionally break the rules. And with the margin between winning and losing now measured in 100,000ths of an inch, crew chiefs understandably feel pressured to push the competitive limits, leaving themselves with little or no margin for error. An insistence on “playing in the gray area” leaves teams constantly teetering on the window ledge of disaster, and sets the stage for the now-weekly penalty debacles. Each week, NASCAR assesses penalties for the same tired violations. And each week, the garage shrugs off those penalties and re-offends. It’s “Groundhog Day” at 190 mph, and the end result is a North American sporting public that sees NASCAR as the sport where everybody cheats and nobody cares. For the record, there are no “good guys” and “bad guys” in the NASCAR garage. 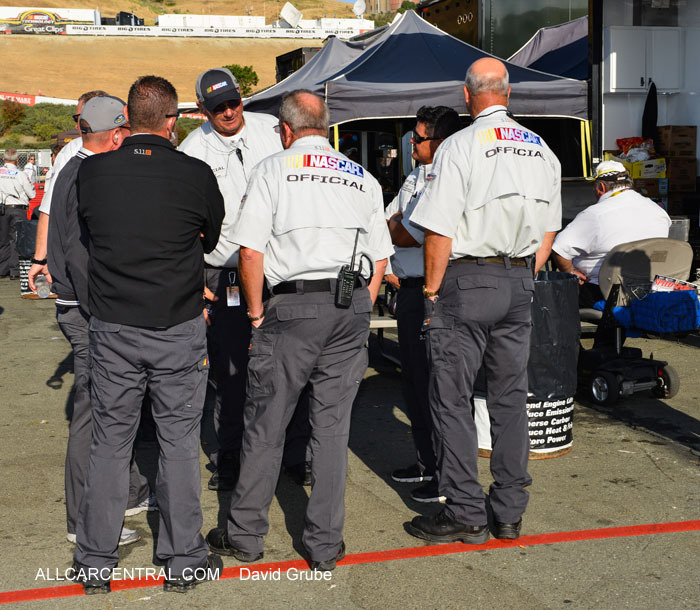 Every man and woman inside that fence – crewmembers, team owners, drivers, officials and sponsors – loves the sport of stock car racing. None of them would intentionally do anything to damage the credibility of the game. But in an era where every position in the finishing order generates millions of dollars in revenue, “What’s best for my team” has gradually supplanted “What’s best for the sport” as the Number One priority. It’s no secret that ticket sales are plummeting and television ratings are at a 20-year low. While those issues are not unique to our sport -- traditional “stick and ball” sports are also struggling -- NASCAR cannot afford to whistle past the graveyard any longer. Our ship is taking on water, and it’s time for the teams that populate the NASCAR garage to break out the bailing buckets and take their role as the sport’s most visible spokespersons more seriously. The attitude among some in the garage that “We don’t care if we kill the sport, as long as we win the race” must change, and soon. The damage done by a seemingly endless spate of 2018 tech line violations is real, and it threatens the very future of the game. Each midweek penalty announcement and Friday afternoon inspection fiasco leaves an ugly black mark on this sport; a sport that has been attempting to erase black marks dating all the way back to its moonshiner roots. Identifying the problem is easy. Solutions are tougher to come by. NASCAR can continue to escalate the severity of its penalties, and pledged this week to do so. But there is another group of individuals within the garage who have the ability to bring these embarrassing rules fiascos to a screeching halt. 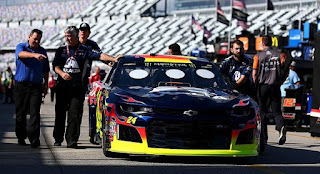 Since its creation in July of 2014, the Race Team Alliance has worked quietly to improve the lot of teams competing on the Monster Energy NASCAR Cup Series. While the organization’s membership roles have never been publicly disclosed, current members are believed to include founding members Chip Ganassi Racing, Hendrick Motorsports, Joe Gibbs Racing, Richard Childress Racing, Richard Petty Motorsports, Roush Fenway Racing, Stewart Haas Racing, and Team Penske, along with more-recent additions Leavine Family Racing, Front Row Motorsports, Germain Racing, JTG Daugherty Racing and Premium Motorsports. The owners of those teams are quite literally the movers and shakers in our sport, wielding tremendous influence with the sanctioning body, sponsors and broadcast partners alike. Unfortunately, they have chosen to operate like Sean Connery and his cohorts in the film “The League of Extraordinary Gentlemen,” working in the shadows while effectively denying their own existence. The men who make up the RTA have set NASCAR’s competitive bar for decades. They win most of the races, virtually all of the championships and have the influence and power necessary to end these weekly inspection imbroglios by lunchtime tomorrow. If Rick Hendrick, Roger Penske, Joe Gibbs and their competitive brethren choose to, they can send an immediate, ironclad and indisputable message to their teams and the rest of the garage, as well, pulling them back from the brink for the first time in decades to a mutually agreeable place within the confines of NASCAR’s 2018 rulebook. It is time for the RTA to step out of the shadows and take its fair share of responsibility for the stewardship of this sport. The organization must make meaningful public, concrete statements – arguably for the first time in its history – about how this sport is going to operate, going forward. It is no longer good enough to leave all the problem-solving to NASCAR. The teams helped create this mess, and the teams must help clean it up. It’s time for NASCAR to sharpen its teeth. In the aftermath of last Wednesday’s most recent slate of post-race penalties, it has become patently clear that the sanctioning body is failing to communicate effectively with its teams by issuing punishments that both penalize the guilty party and discourage others from committing similar violations in the future. Following the race two weeks ago at Dover International Speedway, three of the Top-5 finishing machines were discovered to be outside NASCAR’s technical guidelines. 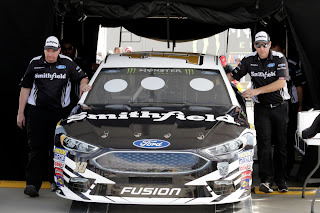 Clint Bowyer’s second-place finishing Ford received an L1 penalty for a rear window support that failed to keep the window rigid at all times. That penalty has become commonplace this season, and Bowyer’s Mike Bugarewicz-led team received the standard penalty of a $50,000 fine for the crew chief, a two-race suspension for car chief Jerry Cook and the loss of 20 driver and owner points. Third-place Daniel Suarez was also busted for wonky rear window supports and received an identical sanction, with crew chief Scott Graves fined $50,000, car chief Todd Brewer suspended for two races and the team losing 20 driver and owner points. Fifth-place finisher Kurt Busch received a post-race L1 penalty for a loose lug nut (crew chief Billy Scott fined $10,000) and Austin Dillon – the 26th-place finisher at Dover – received a pre-race L1 penalty for a front splitter violation. Crew chief Justin Alexander was fined $25,000 and car chief Greg Ebert was suspended for one race. 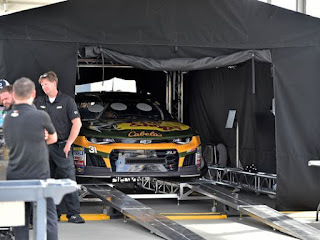 One would suspect that penalties of that magnitude would instantaneously capture the attention of the Monster Energy NASCAR Cup Series garage. 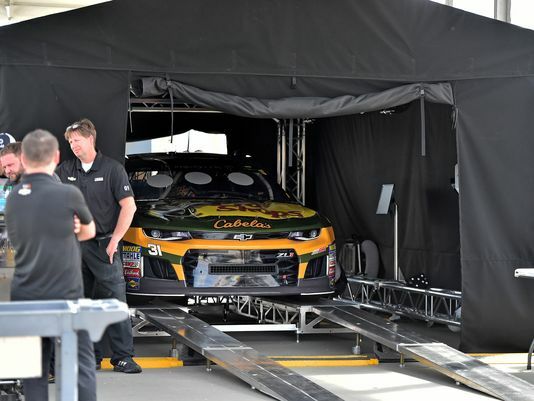 This past weekend – just days after Wednesday’s announcement – a significant portion of the field failed to clear pre-qualifying inspection at Kansas Speedway. Six different drivers – Clint Bowyer, Kasey Kahne, Matt Kenseth, Michael McDowell, Matt DiBenedetto and Timmy Hill – never made it to the qualifying grid, despite the fact that NASCAR delayed the start of time trials by nearly 15 minutes to accommodate repeated inspection failures by those six teams, and others. Three additional drivers -- Kyle Larson, Jimmie Johnson and Jamie McMurray – made single laps in the opening round of qualifying after repeated inspection failures, then opted out of Round Two, saying they were “uncomfortable” with their cars. At least one of those drivers later admitted that the prospect of starting Saturday night’s race on virtually new tires also played a role in his team’s decision to withdraw. NASCAR’s response to this continued malfeasance was to hand out the exact same penalties they have assessed multiple times in the past, apparently hoping for a different result. Last week’s Wonky Window penalties had absolutely no impact on the NASCAR Garage. If you doubt that, just wait until Wednesday, when NASCAR hands down penalties to Kyle Larson’s Chip Ganassi Racing team for a set of carbon-copy window supports that failed to do their required jobs Saturday night, just as Bowyer’s and Suarez’s failed to do at Dover. Just as Kevin Harvick did at Las Vegas and just as Chase Elliott’s did at Texas. That’s five Wonky Windows in 12 races. If flexible rear windows hurt performance – rather than helped it – do you think it would take 12 weeks for teams to solve the problem? Absolutely not. Teams continue to build Wonky Windows for two specific reasons. Because they work (making the race car faster), and because NASCAR has not yet handed down a penalty that even begins to offset the boost in performance those windows provide. Until those two facts change, conduct in the garage will not improve. And to that end, it’s time for NASCAR to ratchet-up the sanctions ad put a stop to Wonky Window Wednesday. It’s time for the sanctioning body to take a nostalgic approach, investing in a few boxes of Sawz-All blades and simply cutting off the offending pieces like they did in the old days, before putting the illegal technology on public display for all to see. Got an illegally modified splitter on the front of your hot rod? We’ll just hack it off – along with a few inches of the front valence, for good measure – leaving your team with the unenviable option of either rebuilding the race car on Friday afternoon, or rolling out the backup. Failed to make it through pre-qualifying inspection? Instead of slapping your hand and banishing you (and your brand new tires) to the back of the pack for the start of the race, why not do what NASCAR threatened to do a few weeks ago, forcing the offending teams to serve pass-through penalties on the opening lap of the race, leaving them a lap or more in arrears before the event has barely begun? Come up short in your post-race visit to the NASCAR R&D Center? Prepare to lose everything you earned this weekend -- every point, every dollar and every bit of playoff qualification -- before sustaining additional post-race fines, point penalties and suspensions. You'll even be bringing back the trophy. And for God’s sake, can we please stop delaying the start of qualifying until the rule-breakers are through messing around? Instead of drawing a line in the competitive sand and refusing to accommodate offending teams, NASCAR sends the exact opposite message. As the lengthening list of repeat offenders clearly indicates, NASCAR’s punitive status quo is not working. The sanctioning body’s intended message is not getting through, and our sport continues to be seen as a place where everybody cheats and nobody cares. 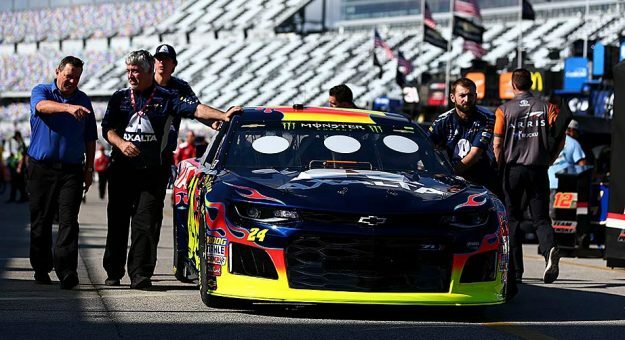 It’s time for the boys in Daytona Beach to man up and begin swinging a bigger stick, retaking control of the garage area from a group of competitors that lately resembles a table full of recalcitrant children, refusing to eat their carrots.